Hearing aids are used day-in, day-out. Because of this, they often require repairs. Even the best-engineered devices eventually wear out. The question for many people is what the most common hearing aid repairs are. Let’s take a look. The connecting tube is a little wire that connects the “brains” of the hearing aid (the section that contains the microphone, processor and battery) to the speaker in the ear. Although well-sealed, this connecting tube can sometimes become clogged with wax. When this happens, signals cannot travel as well from the receiver to the speaker, causing degradation in sound quality. If you notice a clogged connecting tube, you have two options. The first is to attempt repairs yourself, following the user-instruction handbook. Many manufacturers include instructions for disassembly because they know that ear wax issues are likely to arise (since hearing aids do not prevent the production of earwax). The other option is to visit your audiologist for quick and easy repair work. The microphone on a hearing aid picks up ambient sounds and transmits them to the speaker near the eardrum, amplifying the volume. Sometimes, though, it can stop working. The tell-tale signs of a faulty microphone are easy to recognize. Wearers often complain of fuzzy, muffled or quiet noises coming through the speaker. Sometimes they hear static too. 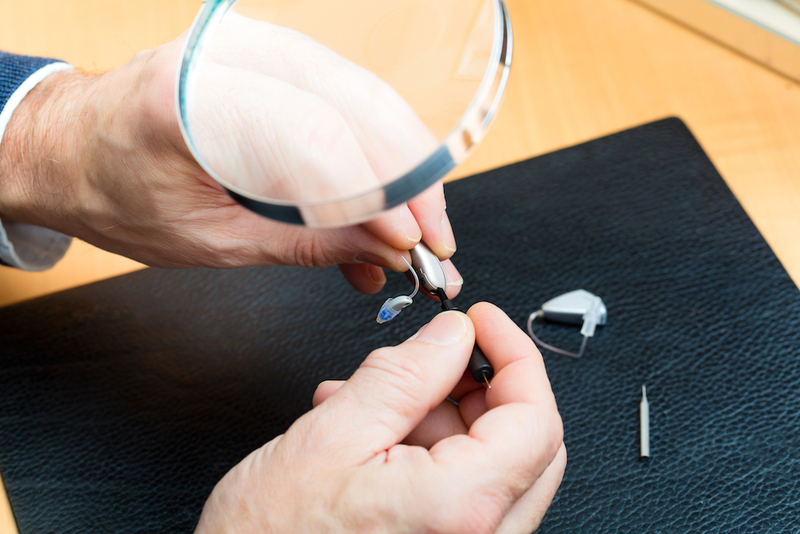 Microphones cannot be repaired at home: they require the help of a professional. If you believe your receiver is faulty or may have stopped working, visit your audiologist. Many hearing aids use rechargeable batteries. Rechargeable batteries are great because they take away the need to have a ready-supply of alkaline batteries sitting around the house. But rechargeable batteries have a flaw: they tend to degrade after several hundred charge cycles, leading to problems with performance. Degraded batteries don’t last very long and can cause your hearing aid to cut out, just when you need it most. The good news is that replacing a degraded battery is easy. Most hearing aids are manufactured so that the wearer can replace the battery themselves, so long as they have the right tools. You can find out which battery your hearing aid uses from the manual. However, if you have difficulty changing the battery, then your audiologist can do this too. So-called “behind-the-ear” hearing aids have ear hooks - little clips that allow the external part of the device to hang from the back of the ear. Ear hooks are essential for holding the hearing aid in place comfortably. Sometimes, though, these hooks can break, thanks to their small size. In theory, it is possible to repair an ear hook yourself, but not advisable. An imperfect repair could compromise the performance of the device. It’s much better to seek out the help of a certified audiologist who can provide the correct guidance and repair work. Finally, you may be suffering a loss of performance because of earwax in the speaker component of the hearing aid that sits in the ear canal. Clean any visible debris off the device and see if it makes a difference.